Thanks to Afreeca's help (facilitation and translation), TL was able to get an interview with members of TBLS. This interview was conducted after the ASL2 quarterfinals have already concluded. We hope you guys enjoy it. On a final note, please don't forget to tune in to either of the official english streams for ASL: Tastosis and Bisudagger/FlaShFTW. 1) Considering that you guys were the top players and pillars of professional BW, what are your current thoughts on the state of the current BW scene? Do you expect an influx of new players in the future? Bisu: A lot of old-timers are making a comeback and people seem to like that. To expect an influx of new players may be a bit out of reach, but I think we can keep things plenty fun with what we have right now. Flash: I think there will be a mass influx of new players in the future, as there are many coming in even now. Jaedong: Although the current state of affairs regarding BW is looking rather hopeful, with interests at an all-time high, because there is no official system in place, I doubt there will be an influx of new players in the future. Stork: Quite a few foreign and domestic Starcraft2 players have returned to the BW scene as a result of their teams being disbanded. Talks of HD remastering also has many people hyped. However, there hasn’t been a mass influx of people in quite some time and the fact that many current pro BW players have yet to finish their military service is definitely a cause for concern. 2) How does the skill level stack up to the older days? Has there been a noticeable decline in skill? Flash: I think that depends on the player. There are some whose skills have gone down, while others have improved. Jaedong: I don’t think there’s a big difference at all. There’s no doubt that competition was much stiffer back in the days, and as such, the gameplay was a lot more intense. However, I believe today’s gameplays have intricacies of their own and they are much more refined as well. Stork: Many players watch VODs of games they have played in the past as a means to regain their skills. There’s no doubt that their skill levels were comparatively higher back then compared to now. But I don’t believe this difference is that great, as new gameplay trends constantly evolve. 3) Who do you think are better now than during their progamer days, and who has gotten worse? Flash: I think herO, EyeWater, and Last have improved significantly compared to their progamer days. As to who’s gotten worse, I’m not so sure. Stork: The skills of those who were placed at the top during their professional careers have decreased, while the skills of those who were just starting out during that time have improved. 4) What about current strategies? Has there been any major shift in the strategies and the meta game since then? For example, there has also been some talk of mech being really powerful in TvZ and hard to handle for Zergs nowadays. Bisu: I think all possible strategies have already been thought up of at this point. Presently, it’s more about the details in which these strategies are played out that decide who wins and who loses. For the most part, I think players with a firm grasp on the basics are most likely to win. Flash: If I’m not mistaken, I think you’re referring to late mechanics. The problem existed in the past as well. But it’s not an impossible hurdle to overcome. Terran’s have their own disadvantages as well. There’s good and bad for every side. Jaedong: The strategies are definitely different than what they used to be in the past, which is the result of similar games being played repetitively. Terran’s strategies changing from a bionic build to a mechanic one is only natural as players adjust things here and there over time. Stork: Strategies constantly evolve, and BW being what it is, the possibilities are endless. However, as many players grow older, it’s difficult to invest the same amount of time and energy as they did before, and as such, their multi-tasking and control skills have relatively gone down. 5) What other strategies do you think are really strong in today's meta? Flash: I personally think the 5 barrack strategy is really strong in today’s meta. It’s the one I use most on AfreecaTV. Jaedong: I believe Terran’s late mechanic strategy is really effective in TvsZ. Stork: To be honest, I have no clue. Strategies follow a cycle. There’s a chance old school strategies can make a comeback. You really can’t know for sure which strategies are better than others. 6) Do you have a favorite matchup that you feel you excel in? What about your worst matchup? Who would you say is your best and worst opponent to go up against in a tournament? Bisu: I think I’ve always done well against Jaedong. I am more focused when I play him because he is such a formidable opponent and also, I play well against Zerg so I didn’t want to lose against that matchup. I don’t think I play great against Shine. He has a very different play style than me and it’s hard to adjust to that. I also enjoy playing with Effort because we have similar styles of playing and we always seem to be on the same page. Flash: I don’t think such matchups exist. 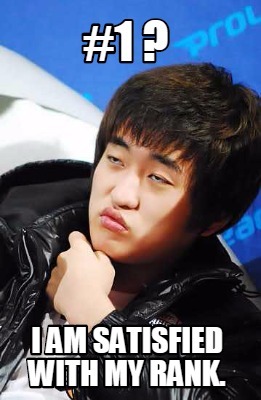 Though, I’m pretty excited to play against Jaedong. Jaedong: I don’t think I have particular match-ups that I excel in or do bad. 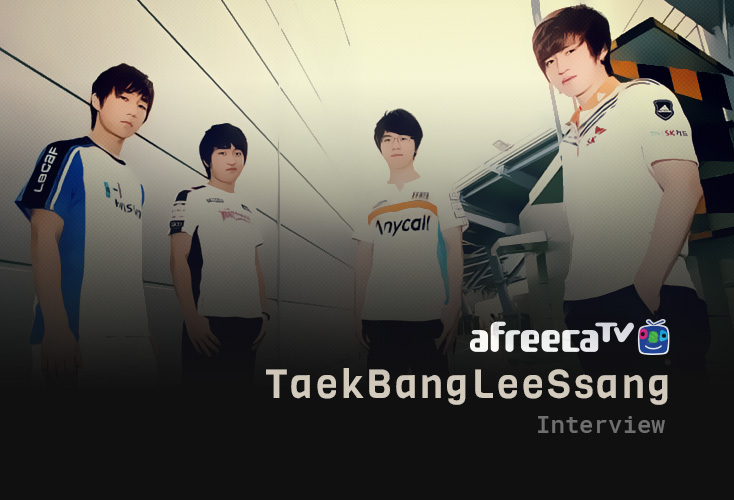 I’m very excited to play other members of Taekbangleessang in tournaments. Stork: I don’t think there’s a specific matchup that I excel in or not do so well. My skills are not dependent upon a certain opponent or a specific game. Rather, it is the result of how much I’ve prepared beforehand, what my condition is like at the time, and how well I adjust on stage. 7) In the post-KeSPA era, there are debates about whether or not the scene still counts as "professional" gamers because there is no governing body or organization that represents the players. However, everyone still works hard and makes a living with their skill. Do you still consider yourselves "professional gamers" in the same way as before, or have things changed? Bisu: I think we’re closer to being personal broadcasters than pro gamers. Flash: I think people nowadays think of us more as professional broadcasters rather than professional gamers lol. 8) Have you ever thought about forming a players' organization that would regulate professional activities, protect player rights, and develop the scene further? Bisu: No, the thought has never crossed my mind. Flash: The thought hasn’t crossed my mind. I’m kinda busy with just broadcasting at the moment. 9) Everyone here has had a chance to start streaming and interacting with their fans on Afreeca. How has the streaming experience been like so far? Is it enjoyable? Is there anything you like or dislike about it? How have you found the fans' reactions? Bisu: I initially started broadcasting at Kongdoo Company’s studio. It was so fun, I regretted not starting sooner. I like how there are different types of fans on AfreecaTV. During my professional careers, I had a lot of female fans come watch me play live, but on cast, most of my viewers are guys…lol. Flash: It’s so much fun. It’s great to know that people still enjoy watching me play even after I’ve retired. Jaedong: I started broadcasting last November as a crew member of Kongdoo Company. Broadcasting is very enjoyable, but because I’m just getting back into BW, the adjustment has been difficult. A lot of my fans cheer me on regardless, and I don’t want to disappoint them. Stork: I really love my job. I used to live on a fairly rigid schedule when I was on a team. Now that I’m on my own, I’m just trying to enjoy this newfound freedom and the chance to interact with my fans in real time. I think they enjoy it too. 10) Another big debate is about the activities of some of the players on Afreeca. Among many questionable things, some players have been seen promoting illegal betting sites, expressing prejudice, and making other very controversial statements. It's all very saddening. How do you feel about these players? Do you think they are harming the scene with their actions? Would you continue associating with them even after their actions? Bisu: I’m not sure whether or not those people are still participating in the BW scene. 11) ASL season 2 has been underway for about 2 weeks. This ASL has been pretty stacked in terms of ex-professional players who all more or less know each other and have played countless games on Afreeca. How did everyone prepare for ASL considering their opponents and how does it differ from your days as pro gamers? Bisu: Before, I focused more on the amount of hours I put into practice. This season, I’ve focused more on strategy and the thought process. Seeing how I’ve been eliminated in Round 8, I think I need to put in more effort. Flash: For me, I think the preparation process has been similar to what I did in the past. I haven’t been able to practice that much because of the pain in my arm. But recently, I tried my best to fight through the pain. Jaedong: In the past, I was part of a team and the preparation process was all pre-set. Now I have to do everything on my own, including finding suitable practice partners, which proved to be very difficult. I also have less to actually practice because there’s so many other things I have to keep track of. Stork: The preparation process nowadays doesn’t even compare to what it was like in the past. Because there’s such a small pool of BW players and no structured system, finding suitable opponents for practice has been a challenge. 12) Recently, Team Liquid published a power rank where they ranked players in ASL (http://www.teamliquid.net/forum/brood-war/516898-asl-power-rank). What are your current thoughts on your own standing (Flash #1, Bisu #3, Jaedong #10, Stork #15)? Do you agree or disagree? How would you change it overall? Bisu: I think being ranked #3 is too high for me. I’ve been slacking off recently as I could have and my skills have suffered as a result. I plan to work harder and one day, become ranked #1. Flash: I am satisfied with my rank. Jaedong: I completely agree with my rank. I’ve only just returned to the BW scene so I don’t expect myself to be ranked higher. Stork: It makes sense. The other players have been playing BW for a lot longer than I have. I mean, I’ve only just gotten into it since Nov. 8th. I’ve also played Starcraft2 the longest compared to them. I believe the ranks accurately portray our performance during competitions. 13) Looking forward to the future, there have been talks floating around that several players have stated that this will be the last tournament they will attend for the fans due to military service. Has anyone here decided when they plan to join the army? (don't have to answer if they don't want to). What about future plans afterwards? Bisu: I’m not sure as to when I should enlist. After I’ve finished, I want to live as I’ve done and just let the river carry me wherever it may lead. Flash: I plan to broadcast for about 2 or 3 years more. I think I’ll start my military service once all the rest have gone and come back. 14) Stork has had lots of experience as a coach for Samsung. Have any of you considered entering coaching in other games? Who do you think would make the best coach, and who would be the worst? Flash: Actually, I’ve been offered a position in the past and considered doing it. But I made the decision to pursue that path after I’ve finished my military service. Stork: Each coaching staff has their own unique style so there’s no one correct way to go about it. Personally, I had complete faith in my players and tried to bring out their potential through encouragement rather than pressure. Becoming a coach for a Starcraft2 team was an unexpected opportunity for me. Not only was I ill prepared for the job, I never got the chance to really contribute to the team because we were disbanded so quickly. 15) Was there ever a time you didn't like StarCraft anymore and you considered playing more as a job than a passion? Bisu: I’ve never once lost passion or interest in playing Starcraft as a career. Flash: Whenever I’ve felt my passion for the game falter, I would take a break and just enjoy some personal time like watching movies. I’ve always been able to overcome such obstacles so I don’t think I’ve ever considered playing Starcraft just as a job. Jaedong: I’ve never felt that way about Starcraft or my career. 16) You 4 have always been called "TaekBangLeessang". Do you like that name? If you were to form a band, what kind of band would it be? Would you name yourselves TBLS or what would you name your band? Who would play what instrument or what would your roles be in the band? Flash: I personally like the name. And I don’t know much about instruments, but I’d want to play the drums. They seem the most easy to play. 17) Lots of players have different nicknames depending on their style among other things. Are there any specific nicknames that you guys enjoy hearing or would prefer that people refer to you with? Bisu: I like the nickname Revolutionary. I suits my style of play well. Flash: I really like the nickname “god”. It’s also what I’m called the most. Jaedong: I like the nickname Tyrant because there it sounds menacing. Stork: I like to think nicknames are born out of interest and attention. I like all the nicknames my fans give me, good or bad. 18) Who is the best with girls? Who is the best wingman? 19) There are a lot of dedicated foreign fans on sites such as Team Liquid who cheer feverishly for your success, debate your games and watch a lot of your stream. Is there anything you would like to say to those fans? Bisu: I believe Team Liquid to be at the forefront of Starcraft related coverage. With that being said, I wish there could be a tournament held abroad for our fans abroad to attend. Lastly, I want to thank everyone out there for their support and love. Flash: It’s been awhile since I had a chance to say hello to my fans abroad. I’m glad to have you guys supporting me and I’ll try my best to show you guys great Starcraft1 gameplay! Jaedong: When I was abroad during my professional career, I was able to endure because my foreign fans had my back. After returning to the BW scene in Korea, I’ve lost the opportunities to connect with my fans abroad. Nonetheless, I will always appreciate the love and support they give me and I hope they continue to remember me as a Professional Starcraft player JD! My only hope is that you guys look well upon my return to Starcraft1, and that despite my shortcomings, you guys will still cheer for me. In return, I will try to become the best that I can be. Flash: I'm satisfied with my rank. flash: "i' am satisfied with my rank" lol... who wouldn't? flash: "i really like the nickname god"
Stork not good with the girls. At least he had a date after his loss. Stork, we will never abandon you! 1. You used you the word "mechanical" instead of "mech" in the early game. 2. Flash is happy about his rank. 3. They never lost passion it seems. Well flash lost it sometimes but could regain it. Impressive imo. Broodwar a really good esport game probably. Great read. And God you just got to love these guys. Who is the best with girls? Who is the best wingman? Why didn't Bisu reply to this question? I hope they enjoy their life out of KeSPa Zoo. He knows I'm on staff. Flash: I don’t think such matchups exist. As in they're all perfect. It sounds like Bisu prefers male fans. More like the least bad. Bisu: I don’t think I play great against Shine. Flash deserves the god nick name :D . Nice interview wooooohooo.